Fridays are usually a pretty good day in the MP office. We celebrate the start of the weekend guzzling coffees & cake in Citizen in the morning, and spend the afternoon knocking back espresso martinis & oysters in Melbourne Public. By the time the weekend rolls around, we are usually pretty full and satisfied (albeit a little high from all the caffeine). 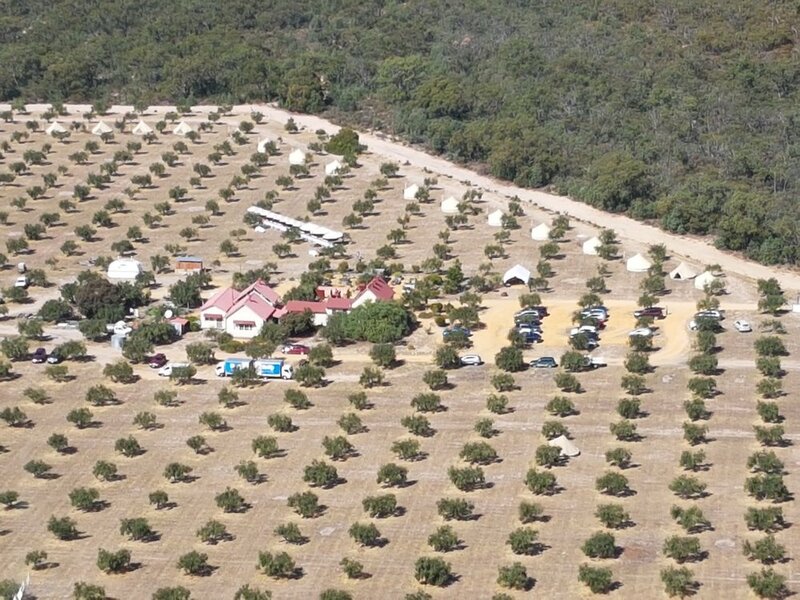 But last Friday exceeded all of our usual Friday expectations, with a helicopter ride to the family-owned Mount Zero Olive Grove in the Grampians for the Regional World’s Longest Lunch. This celebration of Grampians’ food and wine was part of the program of events run by Melbourne Food and Wine Festival, boasting a menu of local, seasonal dishes prepared by local chefs James Campbell (ex Movida) and Mary Clarke (Mason Clarke). Following our rockstar helicopter entrance, we were met by the owners of Mount Zero Olive Grove Jane & Neil Seymour, with their besotted dog Lily in tow. When we asked Neil what had brought them to the grove in 1993, he simply replied “the romance”. And, however we chose to interpret his cryptic words, they really rang true in every sense - the romance of this incredibly beautiful setting was almost palpable. After a few glasses of award-winning local wine, courtesy of local vigneron Viv Thomson (Bests), we sat down to a long table lunch surrounded by Mount Zero’s bountiful biodynamic olive grove, over-looking the northern Grampians. The whole table was laid out with olives, whole tomatoes, olive oil and warm bread and, once seated, we were instructed in the art of making Pan con Tomato - the rustic Spanish version of bruschetta. Also adorning the table were pieces of braised octopus from Robe and Charcuterie from Salt Kitchen Charcuterie. Throughout the rest of the meal we were treated to a carefully curated menu, featuring slow cooked and charred lamb shoulder from Wild Lamb, and Shaw River Buffalo Cheese in the salads and curd. Mount Zero Olives made an appearance in a variety of ways throughout each course – surprising us all with olive oil ice cream for dessert! Keen to try some of these delicious Mount Zero Olives out? Melbourne Public will be featuring them on our menu from May, or head to the Mount Zero Olive Grove before May 7 for lunch, light snacks and farmgate sales in their temporarily re-opened café. Mount Zero have also teamed up with Under Sky to provide pop-up Glamping for those who are looking to stay longer.